2. Combine plums, juice, sugar, butter, and salt in a bowl, tossing gently to coat. Transfer plums to a 13 x 9-inch broiler-safe baking dish. Bake at 400° for 20 minutes or until plums are very soft. 3. Turn oven to broil (leave dish in oven). Broil plums 4 minutes or until pan juices are syrupy. Remove from oven; cool completely. 4. Place 2 plum wedges in the bottom of each of 6 parfait glasses. 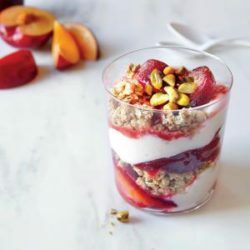 Layer with about 2 1/2 tablespoons yogurt and about 2 1/2 tablespoons granola. Repeat layers once. Top each parfait with 2 more plum wedges, and drizzle each with 1 1/2 tablespoons pan juices. Sprinkle evenly with pistachios.